Entrepreneur and avid cyclist Eric Janszen doesn’t need an excuse to stay in shape. But for the millions of us who do, Janszen believes he’s found it — virtual reality. 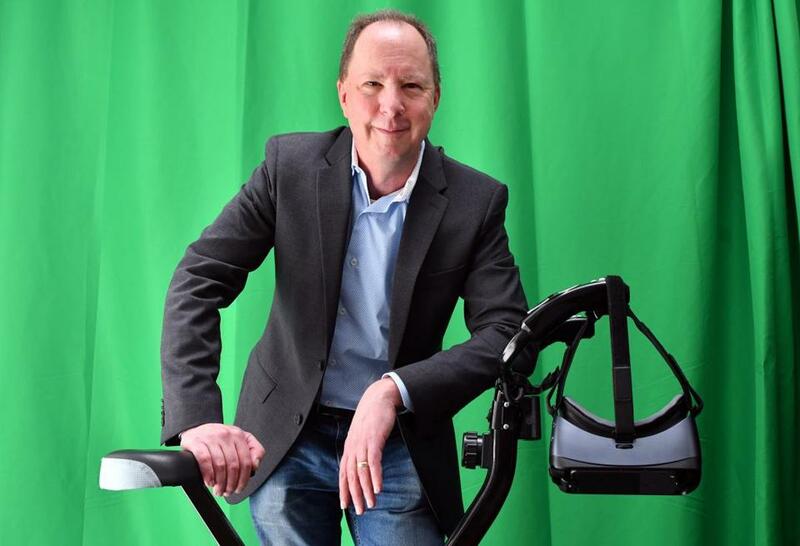 His new company VirZOOM builds exercise bikes that interact with popular VR headsets like Oculus Rift and Samsung Gear VR. VirZOOM also provides immersive videogames that reward players for their physical efforts — the longer and harder a player pedals, the higher the score. Janszen recently spoke with the Globe. 1. The technology behind VirZOOM only recently became practical. But Janszen came up with the basic concept decades ago, when he worked as a sales executive at now-defunct Stratus Computer. 2. Meanwhile, Janszen became a venture capitalist and economic analyst. In 1998, he launchediTulip, an online investment forum that became famous for accurately predicting the stock market collapses of 2000 and 2008. 3. In 2014,when Facebook spent $2 billion to buy VR innovator Oculus, Janszen decided his virtual cycling concept had at last become practical. So he reached out to Eric Malafeew, an engineer at videogame maker Harmonix Music Systems, creators of the massively successful games Guitar Hero and Rock Band. Malafeew cobbled together the first prototype in his basement, using a bike belonging to his daughter. VirZOOM launched in February 2015. 4. Janszen enjoys an occasional movie with his wife, but the current “golden age of television” is passing him by. 5. So far, VirZOOM has shipped about 2,400of its cycles, which sell for $400 each. The company recently introduced a device that adds VR to any stationary bicycle, and it plans to offer a variety of pedal-based gaming experiences to create an endless revenue cycle, and create incentives for gamers to keep on pushing.